Gardeners are encouraged to bring their locally grown seeds to share for swapping. Gardeners without seeds to share may take seeds home for a small cash donation. A’Bunadh Seeds from Cherhill AB – Both seed producers will have their own excellent seeds to sell and be on hand to talk about their farms and growing for seed harvest. –Earthly Matters from Coaldale AB will be selling Worm Factory composters, composting worms, worm castings, Azonite, and their super soil blend. 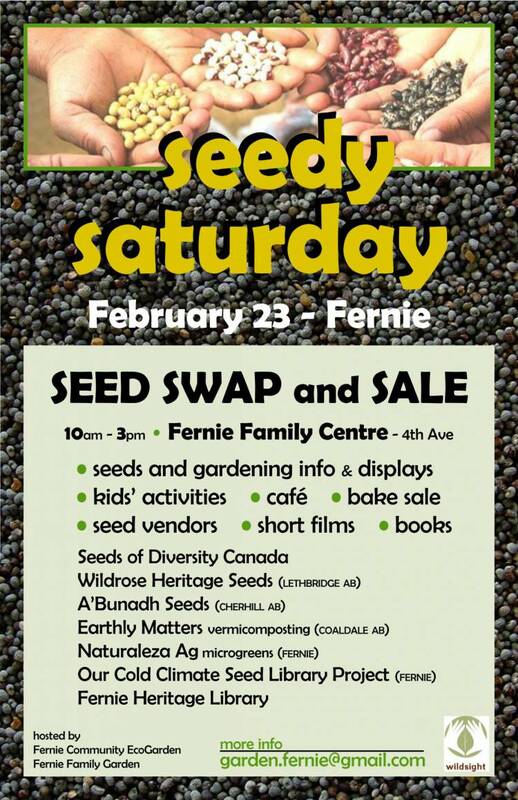 –Fernie Heritage Library will display a selection of gardening books, which can be checked out onsite by Library members. –Valley Vitals will have a display of their composting and food reclamation projects. –Gaetane of Naturaleza Ag will be demonstrating how to produce microgreens for a bumper crop in your own home.